I’m delighted to announce, after a long production process, the latest book I’ve worked on is in its final stages and will be available soon from Amazon! Hungarian Hussar Sabre and Fokos Fencing provides a heavily-illustrated, step-by-step guide for how to fence — and how to teach! — Hungarian sabre fencing, as well as how to use the “fokos,” or long-handled axe traditional to Hungary and East-Central Europe. It covers everything from basic stance work and tactics to complete synoptic tables and how to troubleshoot students who are having difficulty with the material. The manual also provides translated comparative material in order to demonstrate how the lineage the author learned is — and is not — like other methods of fencing taught in Hungary and at the Wiener-Neustadt cadet school in the mid-to-late 19th century up through World War One. I’ve been training with the author, Russ Mitchell, for a couple of years, and I’m happy to be the one providing those extensive illustrations mentioned above. The author is waiting on his final proofs, and once those have been approved the book will be live. I’ll update with a link for interested parties, once that happens. Hello, my faithful and beloved reader(s)! I have not meant to fall off the face of the earth, but … eh … life. The awesome Team Beta has awesomely been beta-ing Steel Butterfly, and giving me loads of good feedback and thinky-thoughts for round two. I have meant to mention some of them here, but … eh … life. The point is, my current Overwhelmedness Level is at about an 11. When I returned to a more regularly whelmed state, I will no doubt have both opinions about things and the wherewithal to go on about them. Meanwhile, I apologize for the radio silence, and here’s a picture I drew of my main characters. 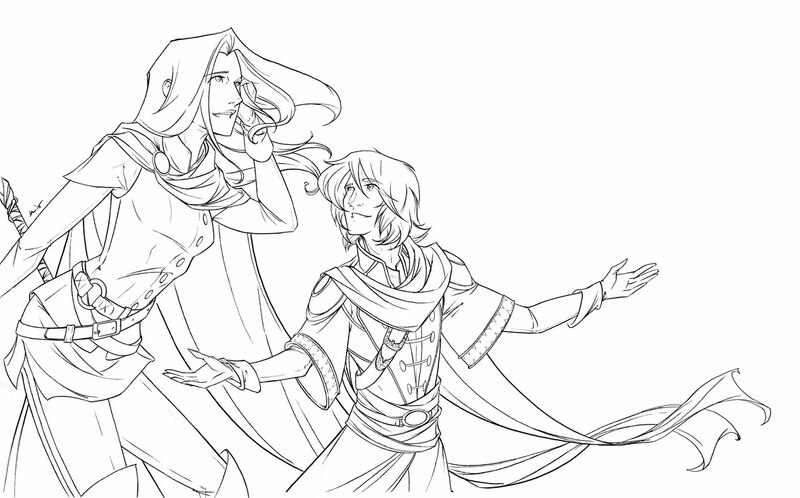 I plan to color it, but (you know) … eh … life. Just imagine a beautiful landscape behind them.